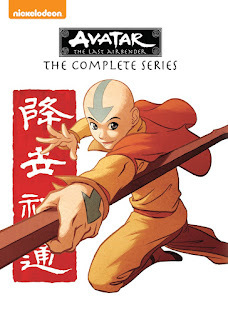 Top Notch Material: Avatar: The Last Airbender: The Complete Series Released Today! Avatar: The Last Airbender: The Complete Series Released Today! My older son is into martial arts, and currently taking a fencing class so he is all about anything martial arts, and loves the show Avatar: The Last Airbender, so he was seriously stoked to receive this new DVD for review. This HUGE boxed collection includes 5 DVDs and a MASSIVE 1496 minutes of run time! That is enough time to keep him glued to the television for weeks and weeks on end! This set makes the most perfect Christmas gift for your little Avatar: The Last Airbender fan too and at around $30, it is a great price point for gift giving as well! Nickelodeon's fan-favorite animated seriesAvatar: The Last Airbender is now available in this exclusive 16-disc special collection which features every episode from all three seasons of the hit show. Avatar: The Last Airbender: The Complete Series contains all 61-original episodes that aired from 2005-2008 - that's over 24 hours of episodes! - as well as hours of bonus features. With "Behind the Scenes" and "Making Of..." featurettes, audio cast commentaries and more, there is no shortage of Avatarfun in this one-of-a-kind collection. Produced by Nickelodeon Home Entertainment and distributed by Paramount Home Media Distribution Avatar: The Last Airbender: The Complete Series is available on DVD October 6, 2015 for a price as low as $30.00. With this Boxed set just being released today, October 6th, I highly recommend you picking it up for your holiday gift giving!